Pharmaceuticals industry is adopting the cell culture trend at a rapid pace. The removal of living cells from an animal or a plant and developing these cells in a controlled and artificial environment is called the process of cell structure. The market for cell structure is anticipated to draw more revenue with major players concentrating on research and development in biopharmaceuticals field. Major vendors of the cell culture market are stressing more on expansion of their product and using strategies that can help in collaborations in order to have a strong foothold in the entire market. Asia Pacific and Latin America are regions with the most potential hence, players are developing collaboration programs in order to establish their market in the aforementioned areas. The launch of new and advanced system is expected to boost the global cell culture market in the long run especially for production on a large-scale basis. The advantages of this is that it is cost efficient as well as retains a very low contamination risk. This serves as a great deal to the players of cell culture market. However, factors like the high standard quality set by leaders of the market and solid regulatory framework imposition may act as a hindrance to the overall growth of the market in the future years. In addition to that, strict regulations, and fetal bovine serum that is required for cell culture production are also envisioned to restrict the market growth. Besides, ethical rules and regulations proportional to using high expenditure in terms of infrastructure is also seen as a restraining factor for the future growth of the market. Nevertheless, due to the fact that both developing as well as developed nations are putting more focus on treating chronic diseases, the cell culture market will soon see a rapid growth as there is more demand for cost efficient and effective products in the market. The global cell culture market was worth a US$ 13.0 Bn in 2016 and is presumed to expand at a 10.0% CAGR within the forecast period of 2017 to 2025. Owing to the rising trend approaching the usage of component-free, and animal-derived mediums and the acceptance of specialty and chemically defined mediums, the global cell culture market is yet to witness remarkable growth in the coming years. The global cell culture market is classified on the basis of end user and product. As per the classification of end user, the global cell culture market is divided into research institutes, academic institutes, pharmaceutical companies, and biotechnology companies. On the basis of product, the market is segmented into reagents, sera, mediums, and instruments. Further classification of instruments are cryogenic tanks, biosafety cabinets, carbon dioxide incubators, and cell culture vessels (Bioreactors). Further segmentation of mediums are specialty mediums, protein-free mediums, serum-free mediums, lysogeny broths, classical mediums, and chemically defined mediums. Sera is further categorized into Fetal Bovine Serum (FBS). Reagents are further segmented into amino acids, attachment factors, thrombin, protease inhibitors, albumin, and growth factors & cytokines. The global cell culture market is studied on the basis of key geographies Latin America, Middle East and Africa, Europe, Asia Pacific, and North America. Asia Pacific is anticipated to boost the market in the coming years owing to the rise in manufacturing of biopharmaceuticals and increase in outsourcing activities over the region. 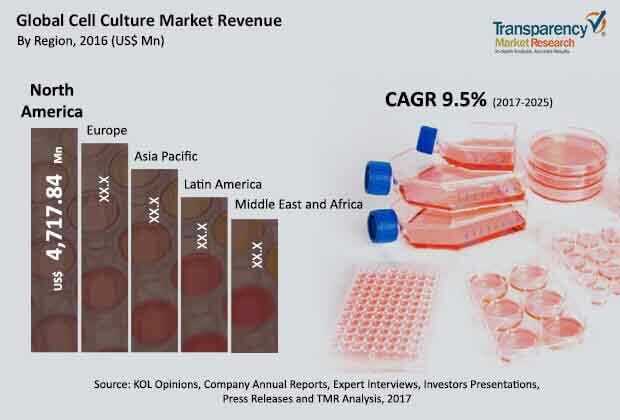 Major players in the cell culture market are Merck KGaA, Lonza, Thermo Fisher Scientific Inc., Dickinson and Company, VWR International LLC, and Sartorius AG. This report on the cell culture market analyzes the current and future scenario of the global market. Increasing product development, rising demand for biologic therapeutics, and growing research on stem cells are major drivers for the global cell culture market. This report on the global cell culture market comprises an elaborate executive summary, which includes a market snapshot that provides information about various segments of the market. It also provides information and data analysis of the global market with respect to segments based on product, end-user, and geography. A detailed qualitative analysis of drivers and restraints of the market and opportunities has been provided in the market overview section. In addition, the section comprises competitive matrix and company profiles with business overview to understand the competition landscape in the market. This section of the report also provides market attractiveness analysis, by geography, and market share analysis, by key player; thereby presenting a thorough analysis of the overall competition scenario in the global cell culture market. Based on product, the market has been segmented into instruments, mediums, sera, and reagents. Product segments have been analyzed based on product categories available in the cell culture market, their cost-effectiveness, and preference for industries. The instruments segment has been sub-categorized into cell culture vessels (bioreactors), carbon dioxide incubators, biosafety cabinets, cryogenic tanks, and others. The mediums segment has been sub-segmented into chemically defined mediums, classical mediums, lysogeny broths, serum-free mediums, protein–free mediums, and specialty mediums. The sera segment has been sub-divided into fetal bovine serum (FBS) and others. The reagents segment has been sub-categorized into growth factors & cytokines, albumin, protease inhibitors, thrombin, attachment factors, amino acids, and others. Based on end-user, the global cell culture market has been segmented into biotechnology companies, pharmaceutical companies, academic institutes, and research institutes. The market size and forecast for each of these segments have been provided for the period from 2015 to 2025, along with their respective CAGRs for the forecast period from 2017 to 2025, considering 2016 as the base year. Geographically, the global cell culture market has been segregated into five major regions and key countries/sub-regions in the respective region: North America (the U.S., Canada), Europe (the U.K., Germany, France, Spain, Italy, and Rest of Europe), Asia Pacific (India, China, Japan, Australia & New Zealand, and Rest of Asia Pacific), Latin America (Brazil, Mexico, and Rest of Latin America), and Middle East & Africa (South Africa, GCC, and Rest of Middle East & Africa). The market size and forecast for each of these regions and countries/sub-regions have been provided for the period from 2015 to 2025, along with their respective CAGRs for the forecast period from 2017 to 2025, considering 2016 as the base year. The research study also covers the competition scenario in these regions. The report also profiles major players in the global cell culture market based on various attributes such as company overview, financial overview, product portfolio, business strategies, and recent developments. Major players operating in the global cell culture market are Sartorius AG, Thermo Fisher Scientific Inc., Eppendorf AG, GE Healthcare, Corning Incorporated, Becton, Dickinson and Company, Merck KGaA, Lonza, VWR International LLC, and PromoCell GmbH.